Turkey offers a range of travel options that fit every type of holiday. 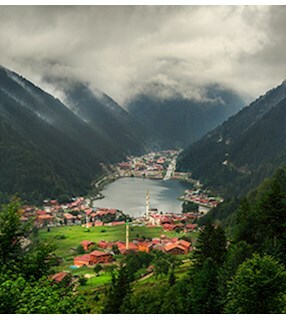 As a home to many cultures, from the Byzantine Empire to the Roman Empire, from the Ottoman Empire to the Hittites, Turkey also has turquoise beaches, modern sights and natural beauty hidden between the mountains. Turkey – featuring extreme sports centres that have skiing, paragliding, bungee jumping and rafting, as well as historical sites like the Ani Ruins, Ephesus and the Gallipoli Peninsula, and natural paradises such as Lake Eğirdir, Butterfly Valley and the Ayder Plateau – provides the opportunity for a full holiday amid the fascinating beauty of the Bosphorus, connecting Anatolia with Europe. Do not forget to browse the travel guides we have prepared for you before planning your Turkey trip! 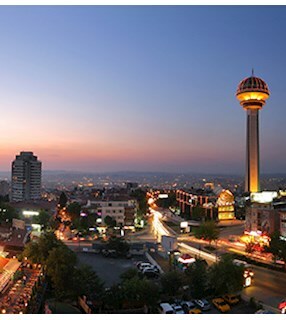 Turkey, with places to visit such as the Hagia Sophia, Cappadocia, Yanartaş (Chimera), Asos, the Grand Bazaar, Pamukkale (Hierapolis) and the Blue Mosque, is a tourism centre that connects Asia and Europe. 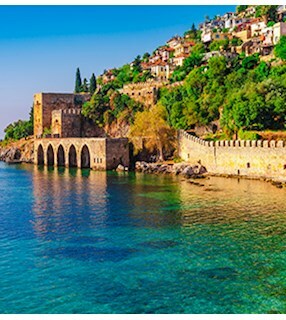 Here in Turkey, you can see a flame that has burned for thousands of years, you can encounter the most exclusive examples of Ottoman architecture, and you can have a quiet holiday away from everything. 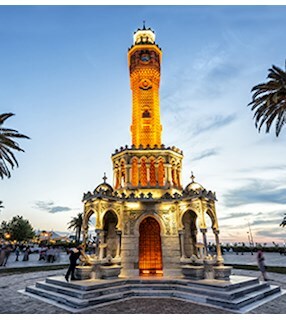 If you want to conduct a historic tour of Turkey, you can encounter traces of numerous empires such as the Roman, Ottoman, Byzantine, Hittite, Seljuk, Lycian and Ionian throughout the country. In many cities, structures like an acropolis – the commercial centre of ancient cities – and a hippodrome – an amusement centre during the Roman period - await history-loving travellers. If you're wondering about places to visit in Turkey, we have a few suggestions for you. Istanbul. For a holiday where you can find everything in one place, Istanbul should be your first stop! 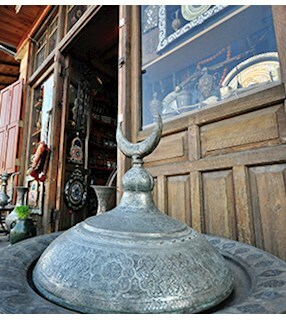 In particular, the Grand Bazaar shopping experience is absolutely fascinating. Visit the cities of Antalya and Muğla to swim in the sea, meet people from all over the world, and enjoy ultra-luxury holiday villages. Fethiye, Bodrum and Alanya stand out with the options they offer. If you want to see the legendary fairy chimneys, head to Cappadocia. Mount Nemrut in Adıyaman is a fairy-tale setting where you can see huge statues. If you want to view one of the oldest ruins in history, put Göbeklitepe, in Şanlıurfa, on your route. Ankara offers some of the best museums in Turkey, as well as Atatürk's famous mausoleum, Anıtkabir. Marmaris is a popular destination for an economic holiday amid blue sea and golden beaches. The finest examples of Islamic art can be seen throughout the country. It is also possible to view the works of contemporary artists in modern art museums located around the Bosphorus. Turkey, where Eastern and Western philosophies intertwine, holds unimaginable artistic and cultural riches. The Istanbul Modern - in Istanbul - holds the pulse of contemporary art in the country, while other talented artists exhibit in galleries located near Beyoğlu, Beşiktaş, Kadıköy and Karaköy. The history of the country is examined in cultural structures such as the Istanbul Archaeology Museum, Topkapı Palace Museum and the Zeugma Mosaic Museum. The world's most famous names come often to Turkey for performances. At concerts in Istanbul, Ankara, Antalya, Izmir and Bursa, residents and visitors alike enjoy themselves. Turkey is also famous for the music festivals held in its holiday resorts, beaches and forests. Festivals like Chill-Out Turkey, Cappadox, Zeytinli Rock and Electronica are just a few of the events where music lovers come together to create a colourful scene. Cinema, literature, theatre, sculpture, poetry... Whether its eastern, western or universal, Turkey has a place for art. Destinations in Turkey offer more than just culture or history. If you’re seeking pure fun, you’ll find many fun things to do in Turkey! And most of these activities are free! The Black Sea region, covered with spruce and beech forests, Cappadocia with its extraordinary natural formations, and the Aegean and Mediterranean coasts where you can swim among ancient ruins, inspires travellers with fun stuff to do. In Istanbul, Izmir and Ankara, you can find any entertainment you want. What to Do İn Turkey? If you want to discover Turkish food culture, be prepared to put on a few pounds or kilos. Turkey, the homeland of sweet syrup desserts, meat seasoned with spices, and delicious pastries, is especially famous for its delicious street food. Casual döner kebab restaurants and köfte (meatball) carts are on every street, as is the Istanbul evening classic, balik ekmek (fish sandwich). Stuffed mussels, boiled corn, grilled chestnuts and grilled sheep's intestines (kokoreç) also feature in Turkey’s popular street food dishes. Some say that the most delicious baklava is from Gaziantep. But Gazientep is not just famous for its incredible baklava, but also for its kebabs. If your path leads to Gaziantep, you will immediately understand why the city was selected as UNESCO’s Most Creative City in terms of gastronomy. For Istanbul residents, some of the city’s irreplaceable moments in food culture include eating balik ekmek alongside the Bosphorus in Eminönü. In addition to street food, several of the best restaurants in the country are in Istanbul. The city offers the full spectrum of culinary arts and food culture, from molecular gastronomy to world cuisines to the most down-to-earth regional dishes. Things change a bit when you head to the Black Sea Region, where you’ll find hundreds of ways to prepare corn and fish: thousands of recipes produced from just two items! In particular, we recommend that you try cornbreads, anchovy pilaf, kuymak and cabbage stuffed with meat. Izmir is in a hot gastronomic competition with Istanbul: Both cities claim to have the best grilled sheep's intestines (kokoreç) and stuffed mussels. Izmir is also famous for its fish restaurants. The famous İskender Kebab recipe originated in Bursa in Turkey! You can find the country's most delicious cheese around Kars and Van. The Van breakfast is legendary throughout the world!